MARCH 9 – International Women’s Day: Celebrate the Revolutionary Women of Cuba & Venezuela! * A free public community event! Since the triumph of the Cuban Revolution in 1959, the women of Cuba have been making tremendous gains in the struggle for women’s rights and equality, organizing a “Revolution within the Revolution” that continues to move forward today. Over the last 17 years of the Bolivarian Revolution, women in Venezuela have also made great advances in all sectors of society from healthcare and education to politics. International Women’s day is the opportunity to celebrate the gains that women have made around the world in their struggle for justice and equality. The revolutionary women of Cuba and Venezuela are leading the way, not only in their own countries but in the world-wide struggle for women's rights. 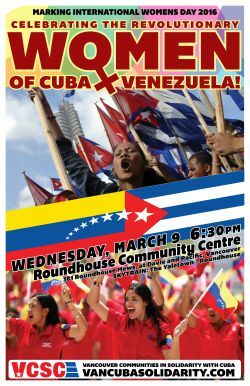 For International Women’s Day 2016, Vancouver Communities in Solidarity with Cuba (VCSC) invites you to join us for a cultural and political evening to celebrate the revolutionary women of Cuba and Venezuela!